Would you like to have in your possession a canopy that contains a great deal of professional grade engineering that can be set up in almost no time at all? If the answer is yes, then the Undercover Professional-Grade Aluminum Popup Shade Package with White Top is just the item that you need to use. Only requiring two people to set up as well as shielding almost all of the suns UV rays, the number of reasons for using this item on all of your outdoor gatherings just goes on and on. Could you please compare this Undercover professional grade with the Caravan 10x20 Aluma? 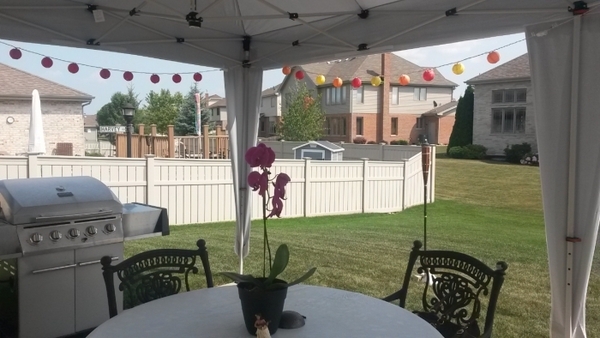 The Undercover 10 x 20 Professional-Grade Aluminum Popup Shade Package with White Top and the Caravan Aluma 10x20 have the same style and size of frame and the same type of set up. The biggest differences are the following: top for the Undercover is 6oo denier and has a vented top and CPAI-84 flame certification. The Caravan is 500 denier but is available in different colors and is both This item is CPAI-84 Flame Certified and NFPA-701 Flame Certified. 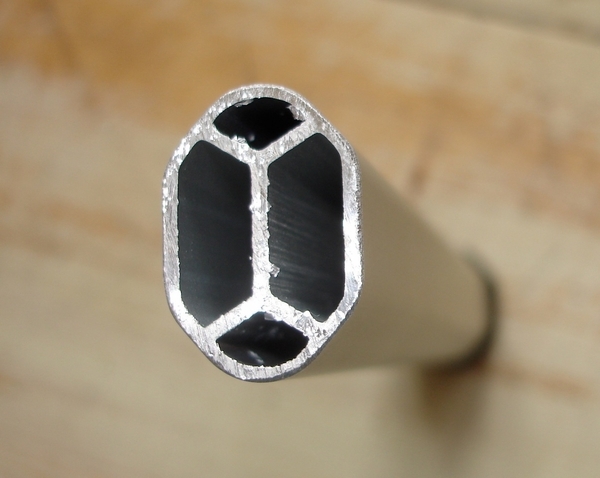 The Undercover has a honeycomb internal tubing and the Caravan has squared tubing, both are 1 1/4" in size. 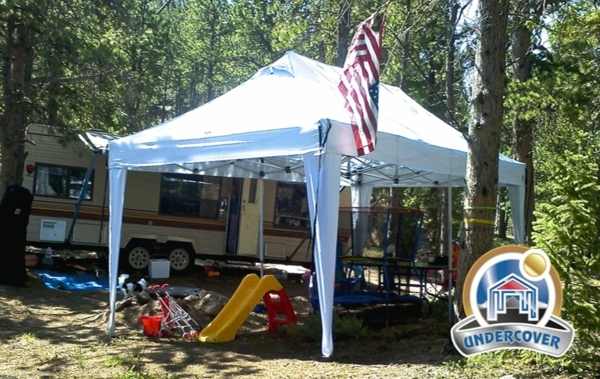 The Undercover has a 5-year limited warranty and the Caravan has a 2-year limited warranty The two canopies are very dependable and very sturdy for any casual outdoor use. How much does this frame weigh? Is this canopy water proof/leak proof? This Undercover is water resistant at best. You may view our only waterproof 10 x 20 canopy here. What is the height with the legs fully extended? The peak height is 11' and the head clearance from the valance to ground is up to 6'11". Does the UCC-UC-3P20W and the UCC-UC-2P20W have the same frame? No; in addition to offering a superior 600-denier white top, this 2P20W model offers a stronger, professional-grade aluminum frame. The 3P20W model has a 300-denier top and a lighter frame. This item is available in white only. The Caravan Classic 10' X 20' Canopy with Professional Top is available in 18 different colors. Can you get the cover in any other color ? This item is available with a white top only. The Caravan Classic 10' X 20' Canopy with Professional Top is available in 18 different colors. Are sides available to close this 10x20 ft. Model? Does this come with side walls? 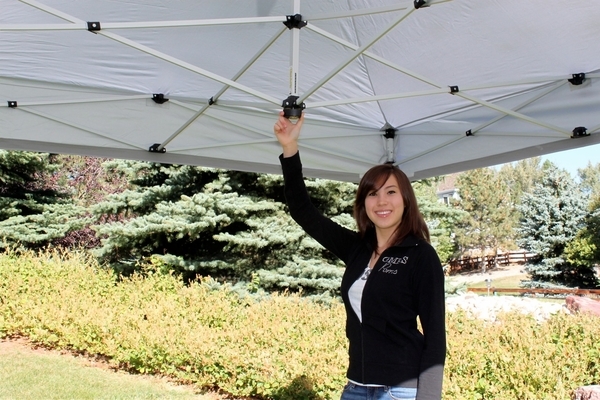 This canopy does not come with sidewalls. You may purchase the sidewalls here. 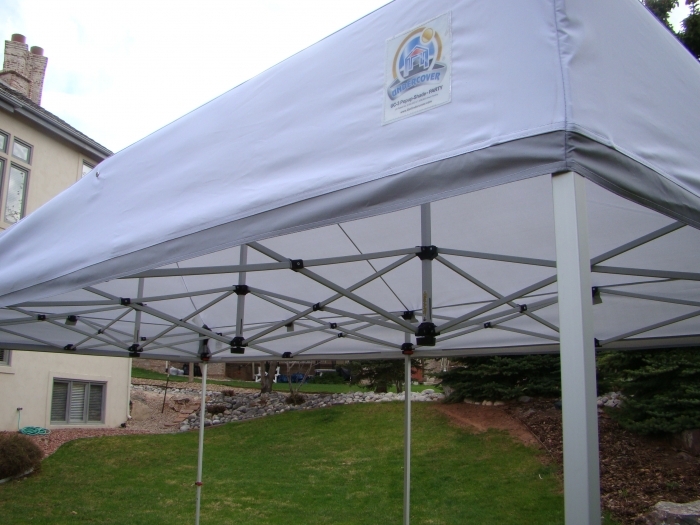 To fully enclose the 10x20 Canopy, two sets would need to be purchased. I read the reviews given online and obviously trusted them enough to purchase. It is not as easy to pop up as the video depicted. Granted, it will probably need several uses before it becomes that way ( poles were tough to move up, took 5 of us) and once it was up, the sturdiness made me nervous. Certainly not strong enough to withstand anyone pushing it over. The legs aren't as strong as I'd hoped...but it is not the industrial grade steel. It will hopefully last a year. ProsLove the storage bag. Fits well inside without a lot of stress. I've only used it a few times so far but it works perfect and is built very strong. I had it bungy coarded down to the side of my trailer and the wind gusted, picked the canopy up and flipped it up onto the roof of the trailer the back down. I couldn't find a single thing wrong with it, still works perfect. ProsIt has air relief vents on the top of the peaks of it. I'm thinking of buying a second one. ConsThe top is only available in white. Used it last weekend at large flea market.Was great,easy up and down.Big improvement in tent area. Excellent product,first time we put it up, it rained 2 inches in one hour,shed the water with no ponding! Easy to put up and lighter than the 10x20 it replaced. ProsThe vent system in the top, the adjustable up support, the material is tuff and it is cooler underneath than the last one I owned,the carrying case is alot easy to use. ConsThe leg covers are useless to me and could be deleted or made an option to save weight and money . What can I say the tent is beautiful. The quality is outstanding and after two uses its much cheaper than renting a tent. The unit is OK if all the snap receivers came with the unit. My canopy had all but one and due to that fact the other two that did come complete tore the female portion right off the canvas.I also called and emailed the manufacturer and never received a email or a call back. Proswell built even if shipped in complete. ConsThe fact that qualty control was not implemented. it has been the best e-z type tent we've owned/used to date, and that's after having gone through a number of the cheapies over the previous few years. Thank you Very MUCH! 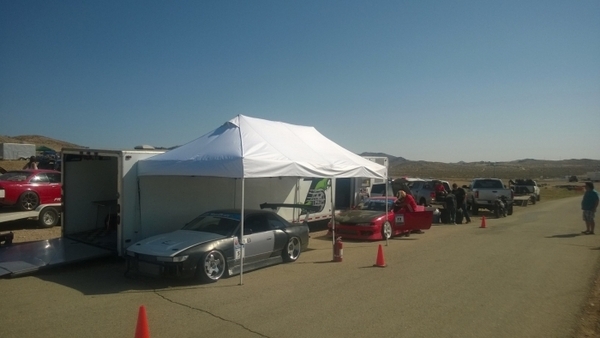 I bought this Undercover brand canopy and took it to a car show first time out-of-the-box, easy to put up, holds tension on the top nicely and doesn't pool rain. This is heavy duty built frame and I am glad for that, since we got hit with bad weather right away, at least 5 canopies around me were destroyed. In the two times I've used it it never even had to drain water off that's to the tensioned top. I would never buy any other brand again. "After owning an EZ-UP 10x20 this product is so much lighter and better built, also it's about half the price. Really like the leg and corner red levers (don't pinch) and the peak pole lifters. The roller bog included is a plus. Haven't used in heavy rain yet but I always did have to waterproof my old canopy seams to prevent dripping. This is a great value and quality. I purchased the weighted tubes also - Awesome accessory.